Now that we've made sure that everyone's feeling the Christmas spirit, it's time for you to start showing the love to others! Of course, there really isn't need to buy presents for all of your friends and acquaintances, but you can always send them a nice and personalized Holiday card, just to let them know that you're thinking about them during the most wonderful time of the year. We'll of course kick off the iOS section with Apple's own Cards app. Just in case you've been living under a rock, Cards is a relatively new application by Apple, which lets you design your own cards and mail them to whoever you see fit. But the interesting thing is that we're talking real cards here - ones that you can actually touch (not via a touchscreen). As we said, you just need to submit your design, and Apple will take care of printing and shipping, which is pretty neat. A card sent to a U.S. address will cost $2.99, while an international one will set you back $4.99 including postage. 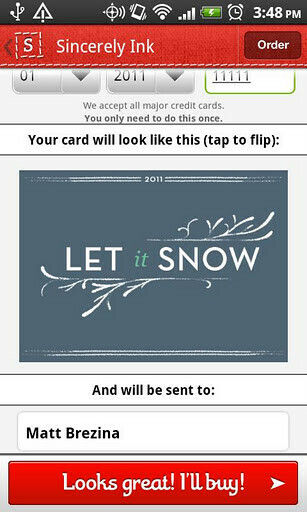 Here's a pretty good solution for quick, last-minute Christmas e-cards. 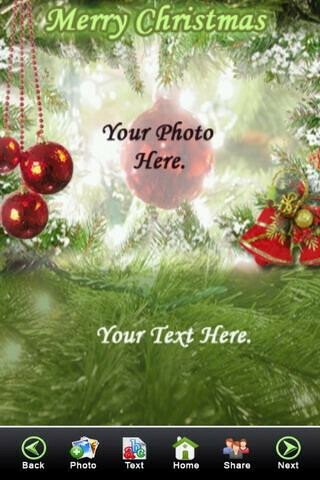 Christmas C@rds comes with 50 templates to choose from, as well as a color picker tool, which lets you change the main color of your card so that it's personalized to the taste of its recipient. Of course, you can add photos and your own text. Once you're done, you can either save the cards to your album, or send them right away. But if those classic, static, and sometimes even paper cards are just too old-school for you, you can always give Holiday Video Cards by vlix a try. 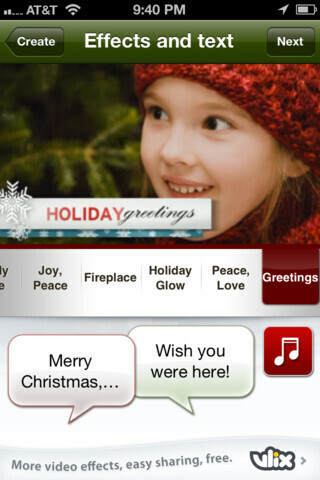 This app allows you to create dynamic video cards using 17 holiday video effects and 16 music tracks selected specifically for the purpose. When ready, you can save the cards to your Camera Roll, or share them via Facebook, YouTube, email or vlix. Not only iOS users can send real paper cards. 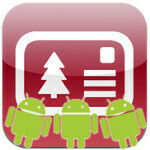 This Android app allows you to do that very same thing, and at a pretty decent price - just $1.69 including postage. Holiday Cards by Sincerely Ink contains a catalog of 30 different card designs for various occasions, so you should be able to find what you're looking for. When you're happy with your card, just submit it and the developers will take care of printing and shipping. Deliveries to the US, UK, Europe and Canada should take less than 7 days, while a card addressed to "the rest of the world" will have to travel about 2-3 weeks. 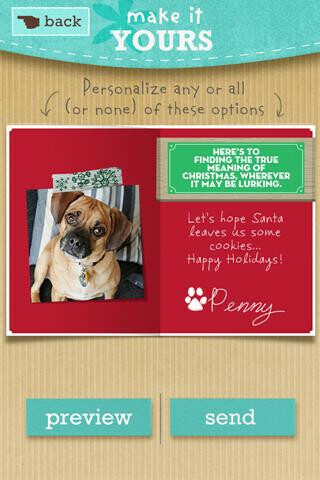 Here's a more traditional approach to online greeting cards. Where Christmas Cards excels is Christmas wishes, as it will let you choose from a nice list of lovely pre-selected messages for the people that you care about. If you've switched your creativity mode on though, you can always enforce your own text in those cards, which you can then share via email, Facebook, Twitter and more. 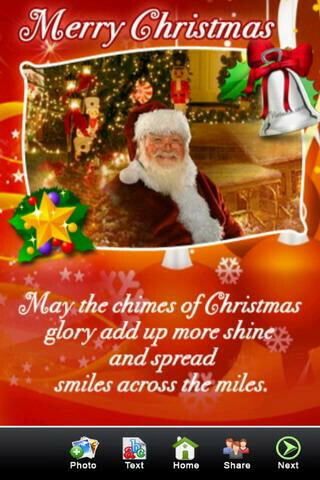 Now, this is one of the cooler greeting card apps available on the Android Market. 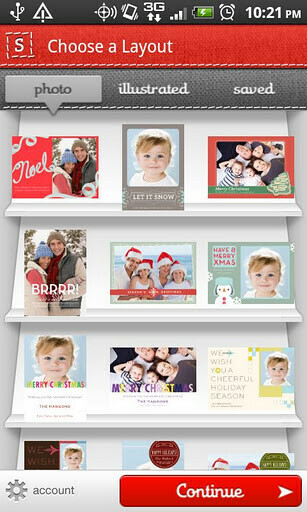 justWink Greeting Cards is actually a universal solution, but it does feature Christmas and New Year sections as well. What's so interesting about this app is that it offers card templates with written messages that can range from funny and cute to bold and sassy. This, along with the fact that the cards themselves are animated and customizable, makes justWink a perfect choice if you are in the mood for something different and witty. 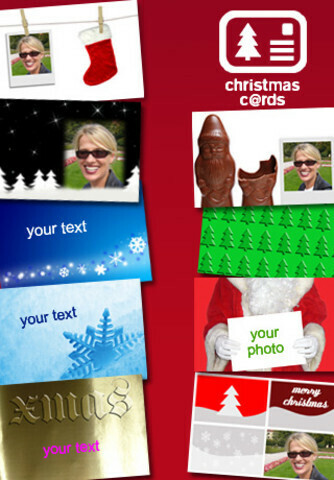 Cards can be send via email, Facebook or text message. I used Sincerely Ink for a few cards this year. My mom received hers yesterday (four days from app to house) She said its nice but I won't comment until I see it for myself. What I will comment on is the pricing. $1.69 per card is only available if you buy 1470 credits for $249. Most people can expect to pay $1.88-$1.98 per card depending on how many credits you buy. Considering what I'd pay for a card and a stamp I am fine with the pricing, just alerting any future users. I use the apple card's app and they are very high quality cards for $2.99.